UNITED NATIONS, June 22 -- As human rights groups call for investigations of the killing of tens of thousands of civilians by the Sri Lankan government as well as Tamil Tigers, and for the government to release the hundreds of thousands of Tamils including UN staff whom it has in detention, some banks and investors see only the chance to profit while there's blood in the streets. Citigroup and Deutsche Bank are reportedly upbeat on "bloodbath bonds." Now, Roman Scott of the Singapore-based Calamander Group brags that the geopolitical risk is "not as bad as the West thinks" -- in essence, monetizing the votes and posturing at the UN Human Rights Counci in Geneva and Security Council in New York. "Scott says even though Sri Lanka makes high-end apparel including Victoria's Secret lingerie, he doesn't like the structure of the business because it's 'far too prone to big single orders.' Tea plantations have 'horrible unionized labor,'" he is quoted. "The rebound will be spectacular," said HSBC Private Bank's chief investment strategist for Asia Arjuna Mahendran, hyping the possibility of Sri Lanka becoming the "Hong Kong of India" and "wealth Indians" investing there. 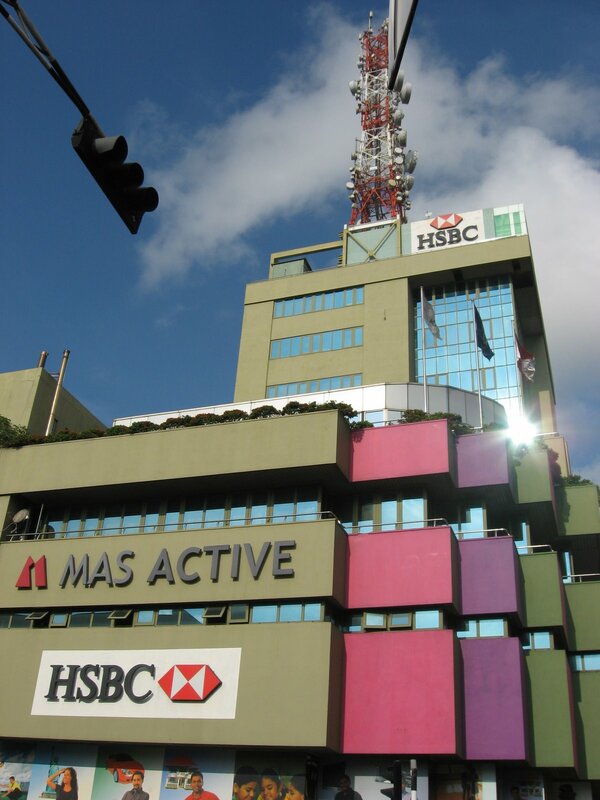 Another HSBC report by Prakriti Sofat is being used to urge countries to drop restrictions on and travel advisories about Sri Lanka: "a report released by HSBC Global Research on 25 May 2009 had forecast... business process outsourcing (BPO), and manufacturing were key sectors ripe for Foreign Direct Investment." But while continuance of the EU's GPS Plus favorable tariff treatment of Sri Lankan textiles, proffered after the tsunami, requires a human rights review, the Rajapakse administration has blocked investigators' access. Click here for Inner City Press on the tariff. The focus seems to be on Sri Lanka's ports, which are to be trebled in size. 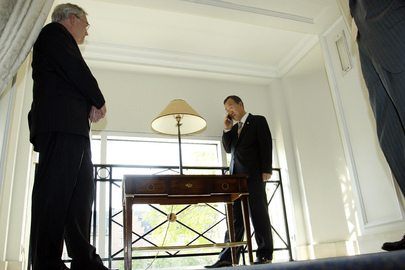 Getting many of the contracts, some have noted, are South Korean firms. But even the International Monetary Fund, which a month ago on May 21 said that the Rajapakse administration's application for a $1.9 billion loan would be approved "within weeks"(click here for the Inner City Press story) now says the proposal is not yet certain, is not agreed to. The government's use of funds for what many call ethnic cleansing is increasingly questionable. This does not dissuade HSBC, or reportedly Citigroup and Deutsche Bank, under fire for standardless banking for strongmen in Gabon and Turkmenistan, respectively. HSBC, multiple signs but no moral compass? HSBC has a global record of ignoring human rights. It was implicated in money laundering with Riggs Banks, for Agusto Pinochet of Chile and other dictators. It has raised funds for controversial Canadian oil company Talisman, and has been sued for lending discrimination. Many now question its blithe gushing at this time about Sri Lanka. Watch this site. UNITED NATIONS, June 19 -- Two UN staff members were disappeared by the Sri Lankan government six days ago in Vavuniya. For days, the UN said nothing. An e-mail was sent to Inner City Press, along with a photo of UN Secretary General Ban Ki-moon meeting with the staff in Vavuniya on May 23. Those disappeared served as drivers for the UN Office of Project Services and UNHCR, the UN's refugee agency. After some inquiries, the UN belatedly announced that two staff had been arrested, leading to short articles in the Indian and Canadian press, neither of which included the staff members' names. They are Kandasamy "Saundi" Saundrarajan of UNOPS and N. Charles Raveendran of UNHCR. They are Tamils. Meanwhile UNHCR's country officer for Sri Lanka Amin Awar continued to praise the government and the internment camps in Vavuniya. While in Sri Lanka in May, Inner City Press published a story about another UNHCR staffer, detained by the government since last year. Amin Awar, who had not responded to an emailed request to comment on the case, approached this reporter in the lobby of the Colombo Hilton on May 23 and argued that the court system in Sri Lanka is complex, but said he was advocating for the detained man. No update has been provided, and now two more staffers, including one from UNHCR, are detained. How much more will the UN put up with, or as some say, cover up? The email, lightly edited, is below. We write this email in desperation seeking your help to put more pressure on Sri Lankan Authorities and release 2 United Nations Staff ( I from UNOPS and 1 from UNHCR ) abducted by Sri Lankan Army Military Intelligence Officials in Vavuniya four days ago and currently detained. We have tried all the possible escalations within UN, including an urgent message to our Secretary-General Ban Ki-moon but nothing has helped so far. We reliably learn that they are now being detained and tortured at a Sri Lankan Army Military Intelligence interrogation camp in Kurumankadu, Vavuniya and since it is weekend no one is taking it serious & taking some bold action for their release or access to them & ensure they are safe. In our May30th Sit Report, our ground officers have highlighted the wide spread abductions and accounted for more than 13,310 missing people in Vavuniya IDP Camps, compared to the previous count. But our higher management in Colombo and Geneva has decided to downplay it and reported it as, “decrease is associated with double counting. Additional verification is required”. They never initiated a project for additional verification. Now we feel the pain of abduction when two of our colleagues are abducted. Photo of our Vavuniya UN Team Group Photo with Secretary General Ban Ki-moon when he visited Vavuniya last month, attached. We don’t know when we will see our colleagues again and the same smile ... please help. Due to security issues we cant talk on phone and sending this email with great difficulty & hope you will understand it. UNITED NATIONS, June 19 --While it has been reported that in the UN-funded internment camps in Sri Lanka "UN officials have been stopped from bringing in cameras and mobile phones," the Spokesperson for Secretary General Ban Ki-moon on Friday told Inner City Press, "I don't think the UN would accept that." Since the UN did accept the detention by the government of UN staff earlier this year, it is not clear if the UN would accept being barred from exposing abuses they see in the camps or even photographing them. The Spokesperson said she would check. We'll be waiting. Despite these reported restrictions the UN's top humanitarian John Holmes, who has yet to respond to requests for comment on the government killing off its investigation into the murder of 17 Action Contre La Faim aid workers, is quoted that "We do have pretty much full access to those camps at the moment." Would that be, access without cell phones or cameras? What does OCHA do when it becomes aware of abuses? It claimed that it advocated quietly about its detained staff. But the government said the issue was only raised once it was publicly asked about by the Press at the UN. At a UN reception Friday day on the topic of sickle-cell anemia, several African Ambassadors expressed to Inner City Press their concern for what has happened this year in Sri Lanka. An Ambassador from the Maghreb asked, whatever happened to the Responsibility to Protect? Before that final push, shouldn't somebody have stopped it? Another referred to reports that LTTE officials who tried to surrender by waving the white flag, after communications via UN envoy Vijay Nambiar, had reportedly been shot and killed. "That is not good," said the outgoing Permanent Representative of a country that itself suffered a genocide. Ironically, these African Ambassadors who are portrayed as more callous than their Western counterparts appear more genuinely concerned. But politics has dictated what has happened, and what is happening. Watch this site. UNITED NATIONS, June 18 -- Less than 24 hours after UN Secretary General Ban Ki-moon was protested as "covering up genocide in Sri Lanka" by a crowd in front of Manhattan's St. Regis Hotel where he received a humanitarian award, Inner City Press at the June 18 noon briefing asked Ban's spokesperson if he'd changed his acceptance speech because of the protest. Ms. Montas replied that "it was going to be in his speech, but he put it in front when he saw the demonstration and he was sensitive to the issues they were raising." Eight hours later at a UN reception following the premiere of HBO's documentary "Sergio" -- click here for this publication's review -- Inner City Press asked Ban the same question, if the speech was changed by the protest. "I heard you were there," Mr. Ban replied. "It was not in my speech text." Inner City Press said that the protesters had included women and children. "It is a free society," Ban said. "I am very much concerned.." Later he returned and added, "I think you journalists, you have a very important duty to send out all the messages." Hence this story. Ban lamented that while people will see a film like "Sergio" and say, let's do something, there is less response "when it comes to real negotiations." Inner City Press recounted that earlier on Thursday at a UN briefing about sexual violence, when Inner City Press asked about Sri Lanka, the speaker from the UN Development Program answered and then said "that is all off the record." "I don't know why [it is] off the record," Ban said. In entering the reception with the others who'd seen the film screaming, a UN security officer blocked Inner City Press' way. "What are you going to ask the S-G?" he demanded. Later when Inner City Press pointed out the double stands, he related and said, but "take it easy." What -- easy questions only? Inner City Press: he said in his speech, he said that, while he was there, he met with opposition figures and Tamil leaders. There seems to be some dispute; I think at the airport, as we were leaving, some Tamil leaders were supposed to be led into the airport and weren’t. Is there some way, maybe not from this podium, can we…? What opposition leaders and Tamil leaders did he meet with while he was there? Spokesperson: I can try to find that out. Inner City Press: In Sri Lanka, this Presidential Commission of Investigation that was set up to look into abuses prior to this year’s upsurge in fighting has been disbanded without imposing any accountability, including for Action Contre la Faim, NGO workers who were killed. 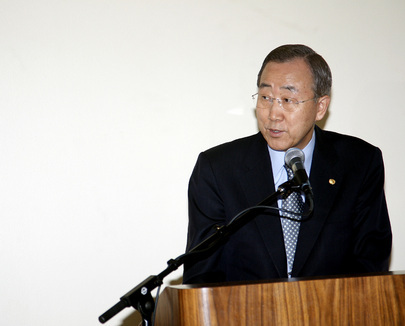 What’s been the UN’s, OCHA’s or Mr. Ban’s response to that? Spokesperson: Well, you know, you heard Mr. Ban’s response about accountability. He said it on Monday during the stakeout; he said it again, was it Monday? He said it here, I think, in his press conference, and you know, that statement stands, you know. He is demanding and asking for accountability. So that stands. I don’t have a reaction to a specific event. But I can stress what I stressed earlier and the remarks he made last time. Spokesperson: I’ll try to see whether we have further reaction to that. Despite a request sent Tuesday morning to Holmes spokesperson, no response has been provided. Ban says that journalists are to tell the story. But which story? Watch this site.